Are you considering putting your ebook for free through Amazon’s KDPSelect program? Then you need this guide! 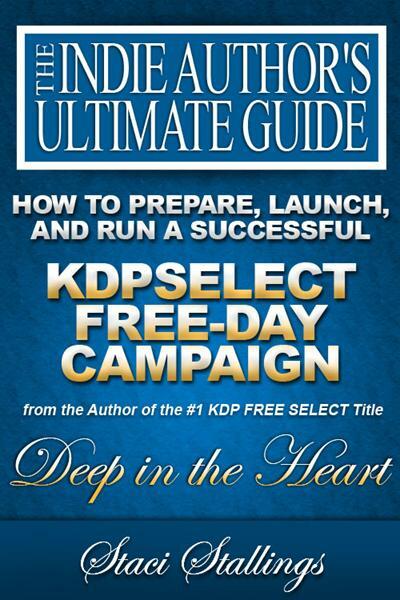 The Indie Author’s Ultimate Guide to KDP Select Free-Day Campaign will walk you through how to set up and run the same “Kitchen Sink” strategy that netted the author the #1 Top 100 Free spot for 36 hours, bringing in 47,000 downloads in the first two days. After those first two days, that book went to #1 on four Amazon best seller’s lists and stayed their for a month! I loved this book by Staci Stallings. Although I already know quite a bit about launching a book via a KDP Select free promotion, I still learned a lot. I tend to prefer Facebook when social marketing, but Staci shared a lot of techniques that I plan to use more thoroughly on Twitter. I like how she not only tells you how to do it, but also shows you her actual tweets as examples. I found that helpful. She also shared a lot about guest blogging which I have found very effective as well. This book is not just for running a free promotion but you can also use the advice/techniques for running other marketing campaigns as well (i.e. $0.99 sales, book launches, etc.). Recommended! I am in the final hours of my first free download days, and I can attest to the enormous help this book was to me. I had never run a KDP campaign before, but armed with Staci’s advice, fans downloaded over 5000 copies and I reached #3 in my category, and #67 in Amazon’s top 100. I will definitely use Staci’s advice again, I’m a believer.